It’s officially winter. The other night it dropped down to 29 degrees (which is normal for this time of year), but by Christmas Eve in just 2 days, the high is projected at 71. SEVENTY-ONE DEGREES on Christmas Eve in New Jersey. The weather has been so completely wacko that we’ve found ourselves sick. All four of us, which is so not the norm for our household. I actually took the girls to the doctor, which is literally the second sick visit Skibbles has ever had. I also keep constantly seeing my friends posting that their families are getting sick too and not just the normal cold stuff, but their kids actually needing breathing treatments, steroids, and more because it’s just so bad. There’s truly not much worse for a parent than to see their little ones, especially a baby, sick. However, the American Academy of Pediatrics conclude that children average 8-10 colds every single year. Sickness is most common between October and May, the colder months, but that peaks between January, February, and March. In just a blink of an eye, January will be here, and I want you to be ready to tackle this cold season naturally. We’ve been working with Safety 1st for a few years and simply fallen in love with their products, so with their help, we put together a list of 10 things that we always have on hand during cold and flu season. Ultrasonic 360 Humidifier – I wouldn’t make it through life without a humidifier for myself, but especially once I had kids. We use it constantly. ClearWay Nasal Aspirator – Seriously, the saving grace of runny noses. Kids may not be 100% fond of it, but they love to breathe afterwards. It’s flipping amazing. Quickread Forehead Thermometer – it’s vital for a parent’s sanity to take a quick temperature. This is it. 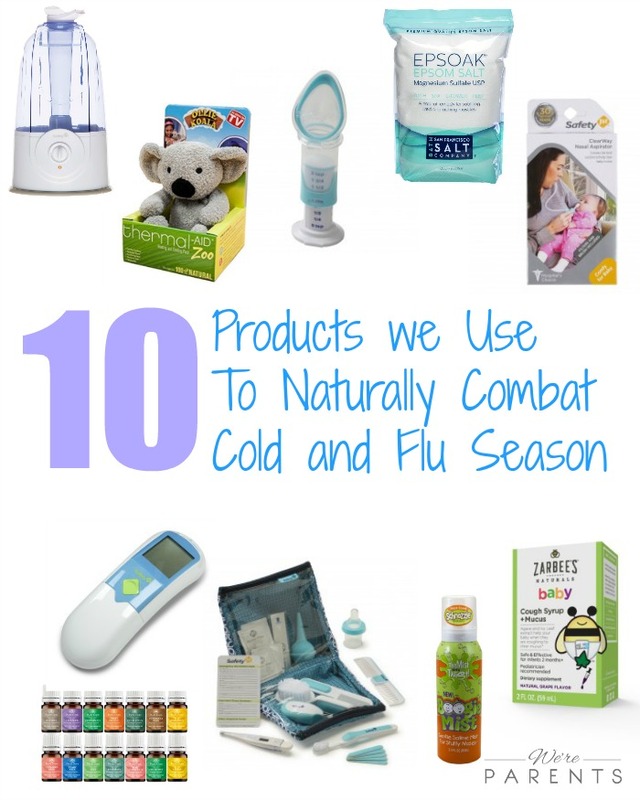 These are the things that we always have on hand in our home to naturally combat cold and flu season. We absolutely love this all and they really helped us these past few days. Leave a comment below and let me know your favorite! Disclaimer: This is a sponsored post with Safety 1st. Products were received to facilitate writing, but thoughts and opinions are 100% my own. Affiliate links within this post. *Disclosure: We received the Graco® Pack ‘n Play® Playard Nearby Napper™ and compensation to facilitate this post. Thoughts and opinions are 100% our own. As we near the end of our second trimester with Baby #2, I’m realizing that this pregnancy has been severely neglected. Not in the sense that I’m not eating right or anything, but that as I chase my toddler around, I’m simply not as involved in weekly pictures and on top of things like I was with Skibbles. However, we were recently invited to a Graco® Live Event to celebrate the new Graco® Pack ‘n Play® Playard Nearby Napper™, as well as being sent one to try out ourselves. 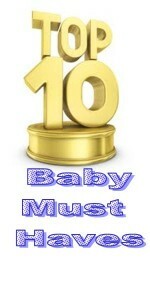 After attending the event and putting ours together, it really kick started me getting ready for this baby. We left the Pack ‘n Play® Playard Nearby Napper™ set up in our living room, so it’s ready to go and every morning that I wake up and see it, I’m excited to do something else to prepare for this little one’s arrival. I’ve always been a huge fan of Graco® products, partly because my mom always talked about how amazing they were when I was growing up, and with 60 years of products, I know they are built to last. 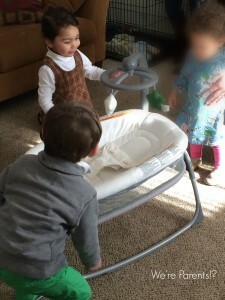 We didn’t purchase a Pack ‘n Play® with Skibbles because we were living in a one bedroom apartment, but when we moved into our house someone gave us one to use. It was just the standard playard and she wasn’t a fan. 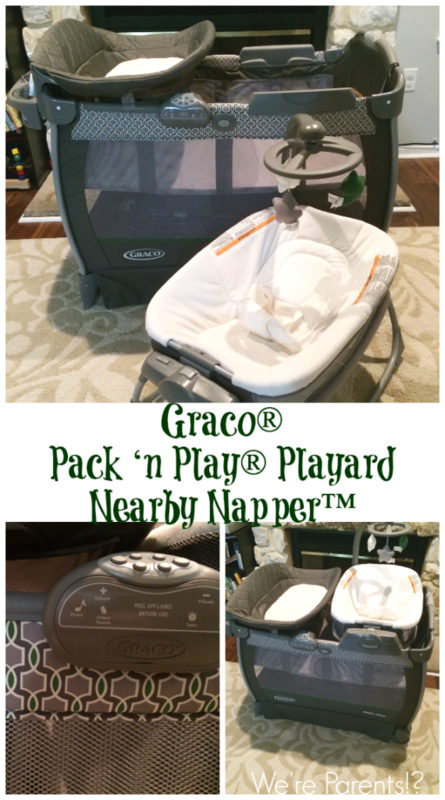 However, as soon as I saw the Graco® Pack ‘n Play® Playard Nearby Napper™, I was instantly hooked. I know that this new baby is going to be absolutely in love with it and it’s going to help me tremendously. We made a video to showcase some of the amazing features — you can view it here! Attending the #AtHomeWithGraco party at gracious host Erica’s house (she writes at No Sleep ‘Til College), really nailed at the major things that I love about the Graco® Pack ‘n Play® Playard Nearby Napper™. Seeing Erica use everything before I had a chance to assemble made me fall in love instantly. Skibbles is a huge fan too and I hope this means that she’s going to be a big help when her little sister arrives in a few months. I really can’t tell you more how much I’m already in love with the Graco® Pack ‘n Play® Playard Nearby Napper™. It’s easy to use, convenient in so many ways, and going to make life with a toddler and a newborn so much easier for us in the months to come! 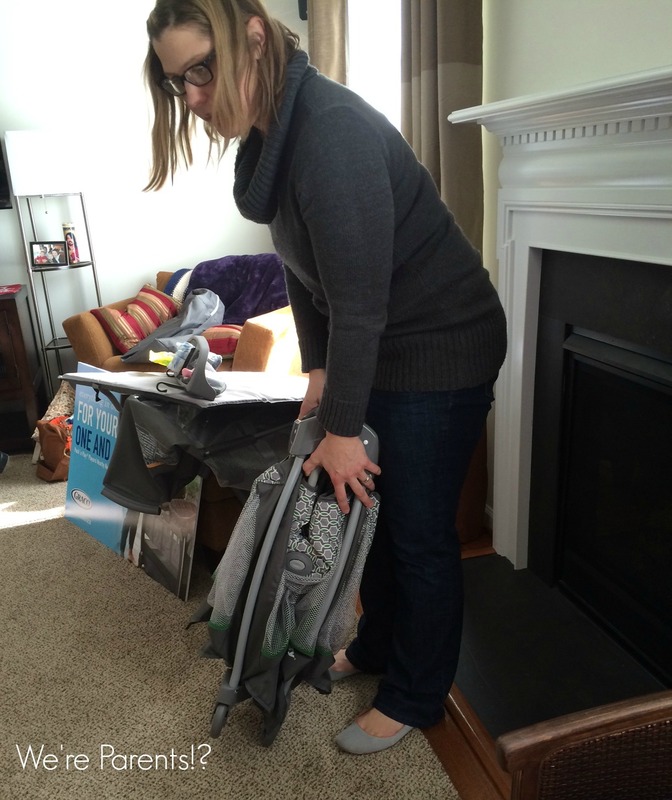 This is a sponsored post written by me on behalf of Graco®. 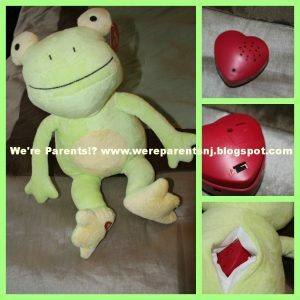 Disclaimer: A product was sent to We’re Parents!? to review free of charge. The opinions here are my own and nothing influenced my opinion. There are affiliate links within this post. I only get paid if you make a purchase; however, this is a source of income and helps to run this blog, so thank you. My Baby’s Heartbeat Bear was started after a mom and Registered Diagnostic Medical Sonographer realized that she could provide mothers with the memory of a lifetime– her baby’s heartbeat. She started by offering them to her clients and quickly realized that she had a special item. These kits are the perfect for baby shower gifts for any new mom or dad to be. They also make the perfect presents for grandparents-to-be. Even if you have to replace the batteries in the kit, your recording never goes away. With over 17 different options, you are sure to find the perfect plush kit for anyone. Some options are shown below. I was so excited to be able to review My Baby’s Heartbeat Bear. The best part of every single doctor’s visit is being able to hear my baby’s heartbeat. As much as I love feeling her move around, that sound is one of the most reassuring sounds I’ve ever heard in my life. I was sent a frog kit to review and was so surprised at how fast it arrived. Once it arrived, I pulled it out of the bag and figured out how everything worked. I was so pleased with how soft it felt and how well it is put together. I took the kit with my to my 36 week appointment (I was supposed to take it to my 34 week appointment, but I completely forgot to take it with me–prego brain). It was super easy to use and record. On one side of the heart there’s the sound mechanism (mic) and also a small circle at the bottom that lights up red while recording, so you know it’s working. On the back side of the heart is the battery component and a switch. When recording you flip it to R (for record) and then when you are done you flip it to P (for play). It’s recommended you put a piece of tape on it so no one can switch it. Then just place it in the back and seal up the velcro! The instructions provided with the kit were well beyond explanatory. I never once had a question about how to use it. The only complaint I would have is that the mic has to be right up against/near what you are trying to record. We experimented a few times before taking to the doctors office and even a foot away sounds somewhat muffled. Once we got to the doctors office, we had to try to record a few different times before you could really hear the heartbeat because it was picking up a lot of static. But if you play around with it, you will get the perfect recording. If you have already had a baby, but love the way these plush kits look don’t worry. These makes AWESOME presents for birthday or holidays for anyone. If you are a parent that travels a lot, it would be awesome to record a message, so your little one can hear your voice every night. It also makes for a great gift for family where you can have your little one record them a message before sending it. The possibilities are endless! Buy It: You can purchase any of the kits for just $35 or any of their other products (outfits, holiday gifts, hats and more) on their website or at Amazon.com. *Disclosure: We received these products free of cost to facilitate this post. Thoughts and opinions 100% our own. Affiliate links contained in this post. You purchase like normal, but we receive a small commission. 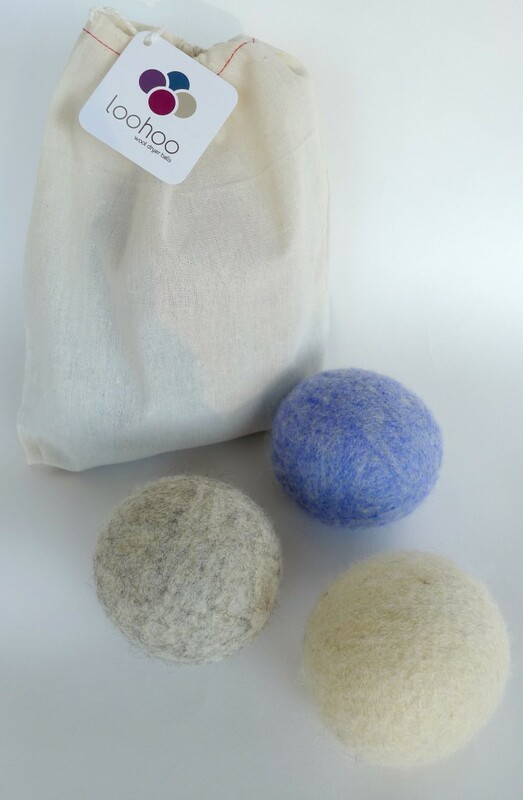 LooHoo Wool Dryer balls are a playful, simple, & sustainable alternative to dryer sheets that helps protect your family’s health and the environment. They help conserve energy and save money, ideal for all laundry, and made in Maine, USA, using 100% wool. I had heard of wool dryer balls from a group of local mamas that also cloth diaper. For many cloth diapering moms this is a great alternative because you cannot use softeners or dryer sheets with cloth diapers for fear of ruining them. For this LooHoo dryer balls review, I was sent the “Classic Pack” and I have to admit I was a bit skeptical. Even after speaking to the local mamas about how wonderful they were, I just didn’t “get it”. How were these “wool balls” going to help? And knowing how frugal I am, I had a hard time wrapping my head around paying $26+ on 3 dryer balls (especially when it is recommended to have 6-8 minimum). I threw a load of clothes into the dryer and I put in all of the dryer balls. I have the worlds slowest drying machine and typically my clothes take at least an hour and a half to dry. With the dryer balls it took about 75 minutes with my first load. With the second load I used the dryer balls with it took a little less than that. This made me pretty happy. What I was really excited about was when I threw a load of towels in to dry. Towels are a nightmare of mine and take forever to dry in our apartment dryer. I typically have to turn my timer to an hour and a half (the longest timed setting) and then come back again and add at least another 30 minutes. I turned the timer to 90 mins and went about what I was doing. To my surprise when the timer went off and I went to check, everything was completely dry. I wish I knew if I could have turned it on less, but I will just have to check again next time! 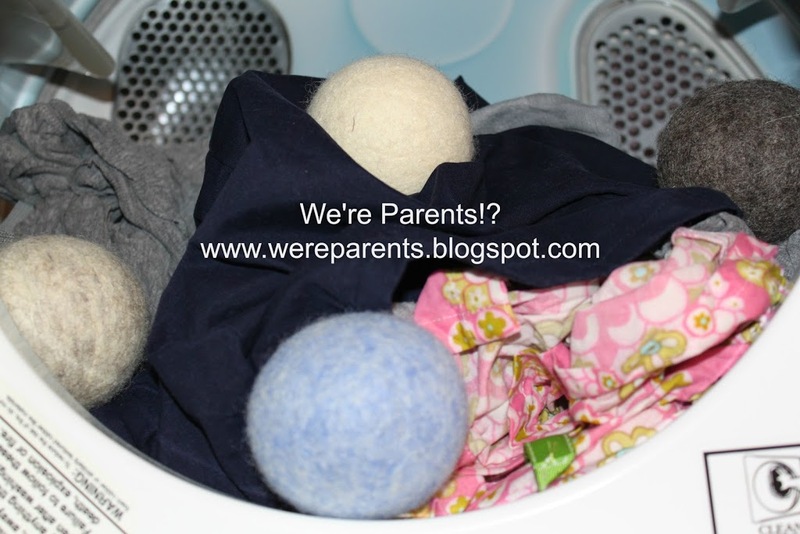 LooHoo Dryer balls are also supposed to help with static in your clothing. Again, I was skeptical. How can these little balls help with that? 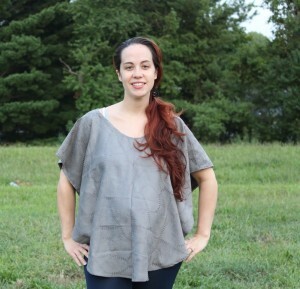 I have tons of tank tops that I have been wearing throughout my pregnancy. Whenever I pull them out of the dryer, they are always stuck together. It’s so annoying. I had 5 of these tank tops in one of the loads of laundry I did. I was very surprised that only one of them still had a lot of static. I’m not sure why that one did, but they fact that the others didn’t, made me really happy. LooHoo clearly makes an excellent product and you are getting what you pay for. Reducing drying time by more than 30 minutes each load and not having to buy dryer sheets and/or softener anymore, clearly outweigh any cost comparison you can imagine. If you are still wanting the scented smell you get from softeners, a few drops of essential oils are great with the dryer balls. Buy It: You can purchase LooHoo wool dryer balls from their website or directly over on Amazon. Disclaimer: I was sent a product free of charge to write this review. The opinions and statements in this post are 100% my own and were not influenced by receiving a free product. We’re Parents!? is not responsible for the delivery of any winner’s prize. *Disclosure: Affiliate links contained in this post. You purchase like you would normally, but we receive a small commission. I remember early in my pregnancy, I absolutely wanted to go set up my registry literally weeks after I found out I was prego. I just thought it was so exciting. So we (yes, I dragged Andrew [actually willingly] along) went to Target, registered, and got the scanner to go start adding things. We got to the baby section …and there you stand… faced with literally thousands of choices. I looked at him and said how are we supposed to know what to pick!? Andrew having never been around kids before looked back at me, like, “Seriously, you’re asking me!? You must be crazy.” So there we stood. Finally, we walked up and down the aisle before making what we thought the best choices were. 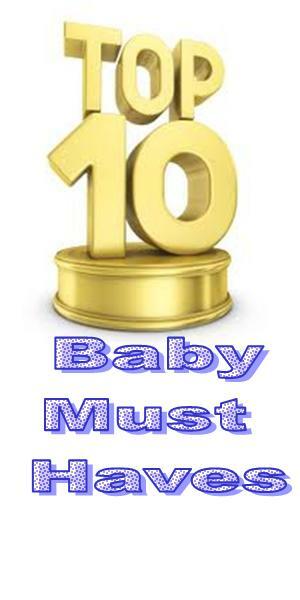 With only 6 weeks left to go, I realized this is a problem that many couples face and decided to put together a list of the Top 10 Must Have Baby Items for any new, expecting parents. This is just a list based on our opinions and your list may differ from ours! What do you think of our list? What did we forget? What’s on our list that was an absolute lifesaver for you? *Disclaimer: I received this product from the company in order to review. The opinions expressed above are 100% my own and I was in no way compensated for this review. Affiliates links contained within this post. We receive a small commission if you make a purchase. When it comes to nursing covers, people seem to either love them or hate them. Waiting on my first loved one to arrive, I’m not sure which side I’m on yet, but I know that my expectation is that I will use them all the time. 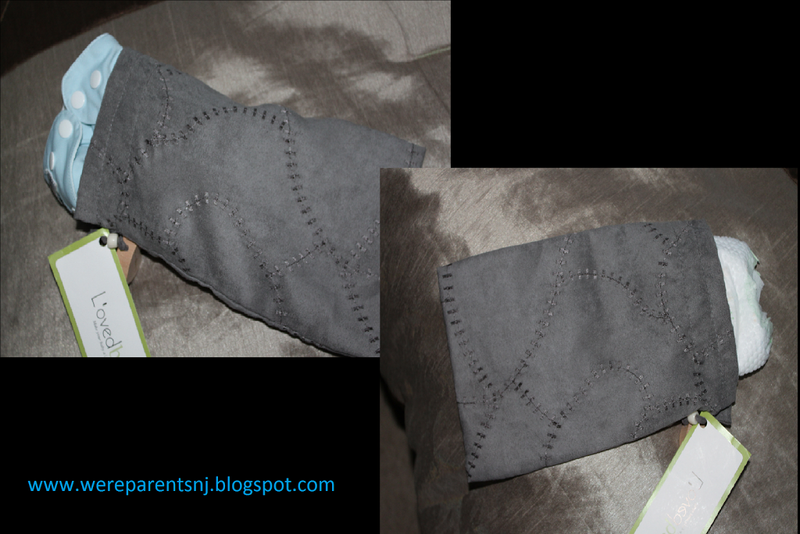 I recently had the opportunity to review L’ovedbaby’s 4-in-1 Nursing Shawl and I can tell you I immediately fell head over heals as soon as I opened the package that they sent to me. It comes in the most adorable drawstring pouch that can actually be used itself for storing one diaper (cloth or disposable) and to-go wipes when your out and don’t want to carry the entire diaper bag. I wanted the option to nurse in public “privately” but everything I find seems so similar to aprons, until now. Since there’s still a great neckline, I will still be able to have eye contact with my baby. Unlike many other covers, this one has a front and back (hence the “shawl”) so it’s stylish and completely blends in with any outfit you would wear. 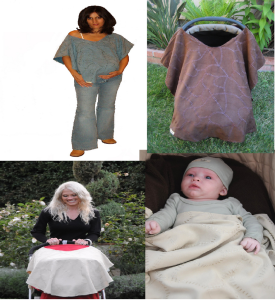 It can be used as a pregnancy poncho, canopy for stroller or carseat, and/or a lightweight blankie, in addition to being a nursing cover. 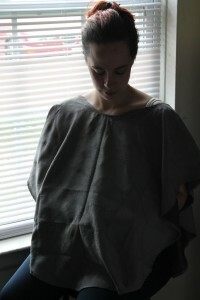 I decided to wear this out with a pair of leggings one day and loved how you couldn’t even tell it was supposed to be a nursing cover and the lightweight feel it had when I tried to see if I would get hot under it while holding my loved one. Final thoughts: I can’t rave about this nursing shawl enough. The material is so super soft that it makes me want to use it as a blanket myself. I love that unlike a different nursing cover I received from my baby shower, this one completely covers me and since there are no clasps or hooks, I don’t have to worry about my baby pulling it down and exposing myself. It’s also machine washable and dryer friendly. Did I mention how soft it was?? The only con I can come up with (which in my opinion, after receiving, I threw out the window) was that priced at $32.95 it was more expensive than I’ve seen other ones go for retail. However, after seeing the versatility of the shawl and the quality, I would pay this price over and over again and plan on it to buy it in other colors. It’s the ultimate gift for any new or expectant mom. In addition to these amazing 4-in-1 nursing shawls, L’ovedbaby also has burp clothes, swaddlers, baby clothes, and gift baskets. BUY IT: You can purchase the shawl in one of seven colors on Amazon.com. ONE Lucky winner will receive their own 4-in-1 Nursing Shawl in the Grand Sand color. Complete the Rafflecopter form below to be entered to win!! *Disclaimer: I received this product from the company in order to review. The opinions expressed above are 100% my own and I was in no way compensated for this review.